The Ompuli Panchayat Youth Association (OPYA) conducted five days long social services using JCB on hire basis from 2nd to 6th July 2018. They conducted social work on 30 km long PMGSY roads from Geram Village to Khunglo village, in collaboration with the Ompuli Panchayat Employees Forum (OPEP). The social service led by OPYA president Nabam Sania. There were huge publics, GBs and member of OPEP participated. The road was lying blockage and deplorable condition for want of maintenance and clearance. OPYA President Nabam Sania informed this daily that the commuters abandoned the road that connects TAH with state capital due to continuously blockage. 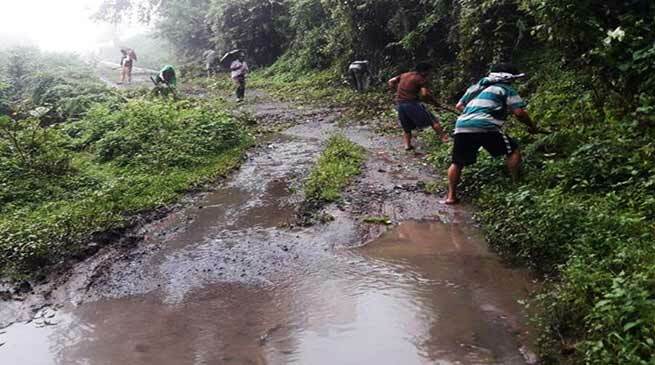 Medical ground problem and economic activities has also come to standstill for which poor villagers had to faces tough time on this particular monsoon season. The social services include clearance of blockage, filled up potholes, clearance of blockage drainage and clearance of jungle to some extent. Further, the first day and second day of social service were conducted at frequently blockage point near Sudum Langpo area on the PMGSY road from Geram to Sudum Langpo and 3rd day to 5th day of social service were held on the PWD road between Sudum Langpo to Khunglo village. Sania added.